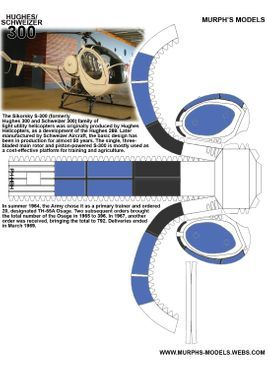 The Sikorsky S-300 (formerly Hughes 300 and Schweizer 300) family of light utility helicopters was originally produced by Hughes Helicopters, as a development of the Hughes 269. Later manufactured by Schweizer Aircraft, the basic design has been in production for almost 50 years. The single, three-bladed main rotor and piston-powered S-300 is mostly used as a cost-effective platform for training and agriculture. 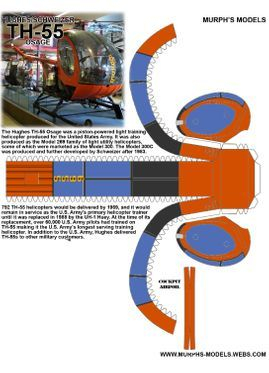 In 1958, prior to full-time production, Hughes provided five preproduction Model 269 examples to the U.S. Army for evaluation as a light observation helicopter to replace the aging OH-13 Sioux and OH-23 Raven. Designated as the YHO-2HU the helicopter was eventually turned down. 9 April 1959, the 269 received certification from the FAA and Hughes continued to concentrate on civil production. With some design changes, deliveries of the Model 269A version began in 1961. By mid-1963 about 20 aircraft were being produced a month and by the spring of 1964, 314 had been built. In 1964, Hughes introduced the slightly larger three-seat Model 269B which it marketed as the Hughes 300. That same year, the Hughes 269 set an endurance record of 101 hours. To set the record, two pilots took turns piloting the aircraft and hovered in ground-effect for fueling. To ensure no cheating, eggs were attached to the bottom of the skid gear to register any record-ending landing. The Hughes 300 was followed in 1969 by the improved Hughes 300C (sometimes 269C), which first flew on 6 March 1969 and received FAA certification in May 1970. This new model introduced a more powerful 190 hp (140 kW) Lycoming HIO-360-D1A engine and increased diameter rotor, giving a payload increase of 45%, plus overall performance improvements. 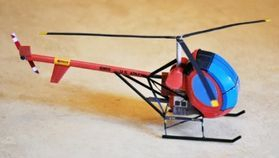 It was this model that Schweizer began building under license from Hughes in 1983. In 1986, Schweizer acquired all rights to the helicopter from McDonnell Douglas, which had purchased Hughes Helicopters in 1984. After Schweizer acquired the FAA Type Certificate, the helicopter was known for a short time as the Schweizer-Hughes 300C and then simply, the Schweizer 300C. The basic design remained unchanged over the years, despite Schweizer making over 250 minor improvements. Schweizer was purchased on August 26, 2004 by Sikorsky Aircraft. 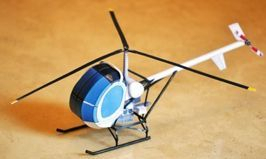 The Schweizer 300 models fill a gap in the Sikorsky helicopter line, which is known for its medium and heavy utility and cargo helicopters. In February 2009, the 300C was rebranded as the Sikorsky S-300C.